Line Jumping 4/24/12 | Sorcerers Of The Magic Kingdom: The Blog! This entry was posted in Tips and tagged disney, hints for sorcerers of the magic kingdom, sorcerers of magic kingdom strategy, Sorcerers of the Magic Kingdom, sorcerers of the magic kingdom card combos, sorcerers of the magic kingdom combos, SOTMK, spell cards, Walt Disney World, WDW by sotmkblog. Bookmark the permalink. I think people are under the impression that since there is no ‘line’ in a conventional sense, nor CMs guarding each portal, there is no real line. 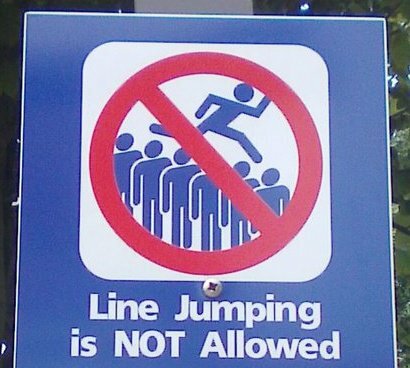 That’s really a shame when you think that the ones doing this line jumping would be the locals who know better. Hopefully, we can get something done about this. I’d really like to see some stanchions and ropes at some of the portals. It works well at the Clock Tower portal. Which is simply by accident because its for ECV parking, but it works! I would hate stanchions. Each portal is supposed to be hidden, and putting up stanchions would ruin that. They would be intrusive when there’s no line.